Cleaning your air filters should be done on a regular basis. Regular maintenance on your projector keeps your projector running smoothly. Part of that is a regular cleaning of air filters. Today’s 1080p projectors generate a lot of heat from their sophisticated optics. To prevent overheating, projectors have a system to draw cool air in via a intake vent. Since you only want cool air coming in, these air vents have filter covering them to catch dust and grime. Unfiltered vent allow dust particulars to settle inside the projector and these can actually catch fire if they get hot enough. Most manufacturers recommend cleaning the filters once every 100 to 300 hours. 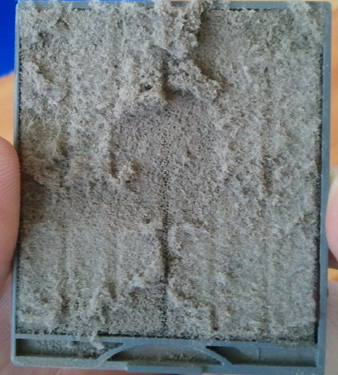 Clean or replace the filter whenever you notice an excessive build up of dust or if any warning signs appear on screen. Air filters that are not cleaned on a regular basis become clogged and prevent the cool air from being drawn inside. This can cause the projector to overheat and even shut down. You also want clean air filters to prevent dust from settling onto the projector lens. When this happens, the projected image may become distorted or the colors may dull and you’ll need to get the projector professionally cleaned. the temperature warning starts blinking orange or red. The color depends on the manufacturer and projector model. A solid color usually indicates that the projector has overheated and will shut off automatically. You can see dust on the projector’s fan exhaust vent. Some manufacturers don’t recommend cleaning the air filter and will supply a new air filter usually when you purchase a new projector lamp. Consult your manual for more details. Don’t wash the filter with soap or water as this can damage the filter membranes. Vacuum the filter with a vacuum cleaner designed for computers and other office equipment. DO NOT use a regular vaccum cleaner. Use a can of compressed air to blow the dust away. Gently shake out the filter to release any dust. NOTE: Never clean the inside of your projector with compressed air. All this does is blows the dust deep inside the projector. Consult your manual for step-by-step instructions on how to clean the air filter.